This is the last week of our fundraiser for Airdrie Angel. For every container purchased we are donating $1 and for every standing monthly order placed $5! At Micro Acres we approach agriculture in an innovative way. Growing in square feet, not acres. As a former GM of a large restaurant Group I have always had the privilege of serving others amazingly fresh and local products in the restaurant scene. However, I have seen food costs for local products go up over the years and we want to change that. 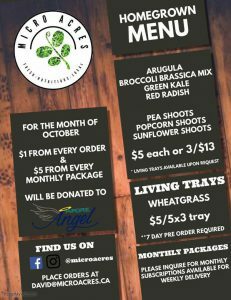 Together my wife and I desire to take that same service and attention and apply it to an incredible product that is local, healthy and fresh 365 days a year that can be delivered to tables and restaurants within hours of harvest. 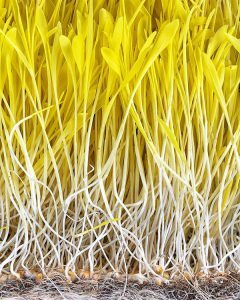 We offer both pre cut and living trays of microgreens. Chefs, retailers and individuals can email us at david@microacres.ca to pricing, questions or to just say hi!